1. Screw l /d ratio: 24 : 1. 2. 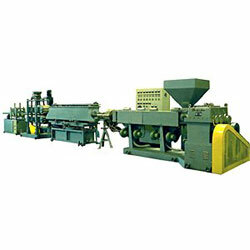 Extruding capacity: 35-60 Kgs / hr. 1. Driving motor: 20 HP V.S. 2. Heater capacity: 20 KW. 3. Temperature control panel: 8 ZONES. 4. Machine weight(approx): 4,000 KGS. 5. Dimensions(approx): 13000 x 2000 x 1600.